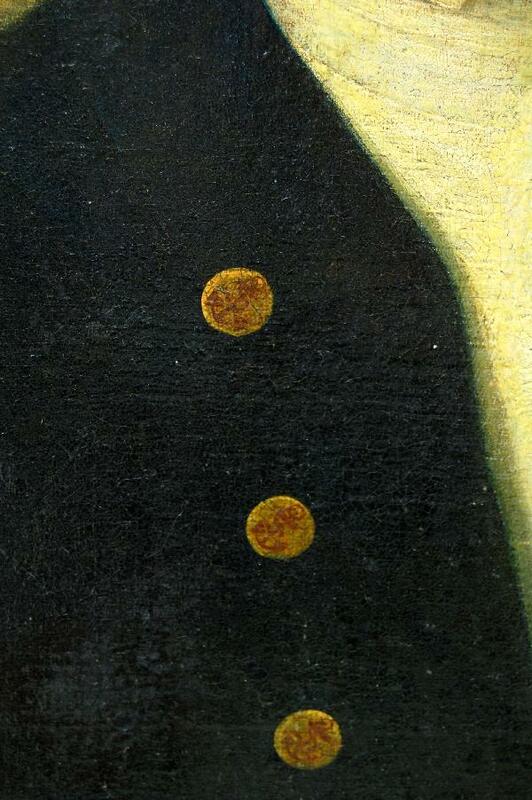 Captain John Barry and Lt. Richard Somers are back together again, if only as portraits for sale for the first time in generations, maybe centuries. Both portarits are being made available from New York art collector and dealer Bruce Gimelson [ http://www.brucegimelson.com/ ] who owns the Barry painting and has the Somers painting on consignment from the owner, who purcahsed it from a Hepburn family member about 30 years ago. It last appeared at an auction in 1938 in New York. Although it is labeled Lt. Richard Somers, it is more likely a young John Barry. Captain, later Commodore John Barry, has bridge of the Delaware River, a guided missile ship and city streets named after him, and is generally considered to be the Father of the US Navy. As a hero of the Revolution and the first commissioned flag officer in the Navy, Barry is buried below a statue of him behind Independence Hal. Lt. 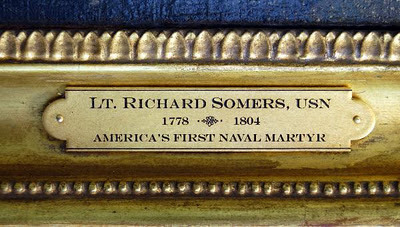 Commander Richard Somers, one of the first Midshipmen to serve under Barry on the frigate USS United States, is buried in Tripoli. After the death of Somers' father, a Revolutionary War privateer, Barry became somewhat of a surragate father to Somers. After being commissioned a lieutenant and given command of his own ship,the schooner Nautilus, Somers sailed to the Mediterranian to fight the Barbary Pirates. Somers distinguishing himself in combat during the Battles of Tripoli, then died in the explosion of the USS Intrepid on September 4, 1804. He is burried near Tripoli harbor. So for history buffs, there's nothing better than having two original oil painted portraits of true American heroes going on sale together, and for the first time maybe since they were painted over two hundred years ago. Local historical societies are looking at trying to purchase them and put them on perminant public display, but if they are purchased by a private collector they will once again be relegated to someone's private palor and not available to the general public, students and researchers. John Barry Kelly is leading one effort to obtain the Barry portrait and have it hung at the John Barry Center in Philadelphia, or the Union League, if someone there is wealthy enough and interested enough to buy it and put on public display. But its not without controversy. The Lt. Somers portrait is not garnering much interest as the six-figure asking price is out of reach and most question the identity of not only the painter, but the subject. There is serious questions by art historians over the identity of the artist, as well as to the actual identity of the portrait labeled "Lt. Richard Somers First American Naval Martyr, 1778-1804." It just doesn't resemeble a side angle of a known portrait of Somers, which features a more prominent nose, so it is not believed to be that of Somers. The real Lt. Commander Richard Somers, USN, had distinctive nose. Some say it resembles a young John Barry, but Bruce Gimelson says that he had the foremost John Barry authority in the world proclaim its not Barry. O/C backed by mahogany panel - Lt. Richard Somers, poss. James Peale. According to a letter dated May 21, 1996 from the National Portrait Gallery of the Smithsonian ' In my opinion, this portrait is not by Charles Willson Peale, but may be by James Peale (1749_1831) or some other Philadelphia artist. Richard Somers SOMERS, Richard, naval officer, born on Somers point, Great Egg harbor, New Jersey, in 1778; died near Tripoli, Africa, 4 September, 1804. His grandfather emigrated from England about 1730 and settled at Somers point, and his father was colonel of militia, judge of the county court, and an active Whig in the Revolution. The son entered the navy as midshipman, 80 April, 1798, after some experience at sea in small coasting vessels. He sailed from Philadelphia in the frigate "United States" in July, 1798, to Cape Cod and along the coast to the West Indies in search of French cruisers during that brief war with France. He was commissioned lieutenant, 21 Nay, 1799, sailed in on 3 November, 1799, and in 1801 again went to France as 1st lieutenant of the sloop "Boston," with Chancellor Livingston on board as passenger. He was appointed to command the schooner "Nautilus," fitted out to form a part of Preble's squadron in the war with Tripoli, and he was the first to arrive at Gibraltar. He participated in the blockade and operations at Tripoli in 1803-'4. In the first attack he commanded a division of gun-boats, and at one time fought five Tripolitan vessels at close quarters. On 7 August, 1804, he led the 1st division of three gun-boats in the second attack, and successfully fought superior forces for three hours. He was promoted commander, 16 February, 1804, and was conspicuous for his ability in the attacks on 28 August and 3 September, 1804. As the season for operations drew to a close he proposed to destroy the Tripolitan fleet by fitting the "Intrepid" as a bomb-vessel to explode in their midst and cause a panic. About 15,000 pounds of powder and 200 loaded shells were stowed in the "Intrepid" and arranged with a slow-match to explode after the crew should have escaped. Lieutenant Henry Wadsworth, Midshipman Israel, and ten men voluntarily accompanied Somers in the night of 4 September, 1804, toward the inner harbor, convoyed by the brig "Siren." The enemy sighted the "Intrepid" and opened fire upon her as she approached, and when 500 yards from her destination she suddenly blew up, and all on board perished. No damage was done to the enemy. The cause of the premature explosion was never ascertained, and none of the bodies of the unfortunate crew were found. The report was heard for miles, but it had no effect except subsequently to convince the foe that Americans were ready to undertake the most perilous measures to accomplish their object. Other events had prepared them to dread the American navy, and, since this was the last hostile operation, it doubtless was potent in the negotiations by which the Tripolitans acceded to the terms demanded by the Americans. Congress passed a resolution of condolence with the friends of those who perished, and several ships of the navy have been named after Somers. Oil on canvas mounted on board; 29 ¼ x 24 ¼ inches. Philadelphia, circa 1801. Lawrence Park* describes it thusly: “Bust, three-quarters to the right. His thin white hair is tied in a queue bow. His uniform coat is blue with buff lapels and high standing collar, gold epaulettes and buttons; he is wearing the badge of the Society of the Cincinnati in his lapel. Plain background of neutral color.” Period frame. Restored in 1937 by Ms.Hannah Horner of Philadelphia. Some slight in painting within the field but the face is left virtually untouched. *Lawrence Park, GILBERT STUART, An Illustrated Descriptive List of His Works…, Volume I, pp134-135, No.59; New York, 1926. Illustrated in Volume III, p.38. Rice & Hart, National Portrait Gallery of Distinguished Americans, 1854, Volume 2, plate 10. Numerous others available upon request. 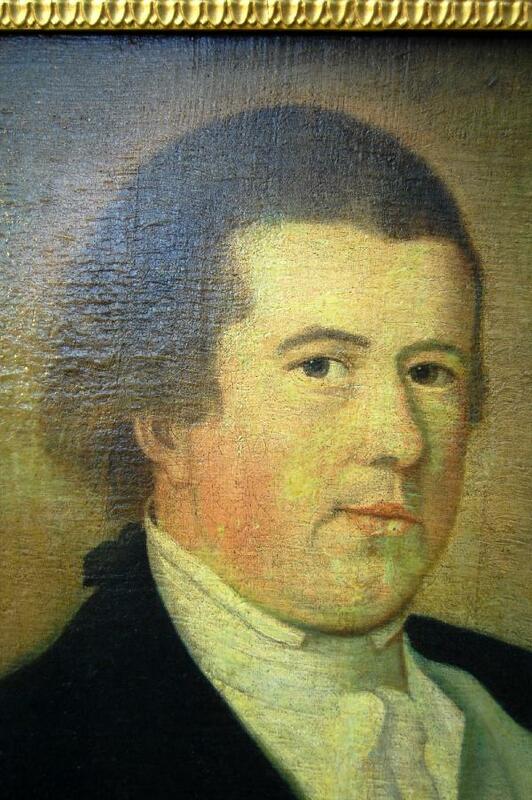 Commodore John Barry immigrated to the United States from Ireland and settled in Philadelphia at the age of 15. Always interested in the sea, over the next six years he gained his mate’s rating, chiefly through working on ships in the West Indies. Willing and Morris, the largest ship owners in colonial America early saw the talent in the young Barry and hired him to sail goods from Philadelphia, Baltimore, and the West Indies to Bristol. His knowledge of the West Indian waters was key to many victories on ships he commanded during the Revolution. In 1775 Barry was asked by Congress to outfit the Continental Navy from scratch. This he did ably, and with Robert Morris prominent on the Marine Committee and a major figure in financing the Revolution Barry soon took command of one of Morris’s ships, The Black Prince which became The Alfred in its naval service. He next commanded the famous Lexington in 1776, which captured several British vessels, and went on to captain the Effingham, the frigate Raleigh (1778), and the Alliance, which captured three British warships, and three privateers during the period 1781-1783. As Captain of the Alliance he escorted General Lafayette and the Vicomte de Noailles back to France. In 1794 Commodore John Barry was given Commission Number 1 by Congress signed by President Washington appointing him the senior Captain of the newly established United States Navy. He commanded the frigate United States that saw action during the Quasi-War with France in the West Indies. In 2005, by joint resolution of Congress a law (Public Law 109-142) was passed officially recognizing Commodore John Barry as “first flag officer of the United States Navy”. He is the favorite son of the AOH (Ancient Order of Hibernians), and there have been two ships named after him, one of which is a centerpiece of the Naval Museum, and the other, the new USS JOHN BARRY (DDG-52) is in active service on the high seas today. The Somers is probably by James Peale but that is only an attribution. Sometimes this type of information gets lost in families. 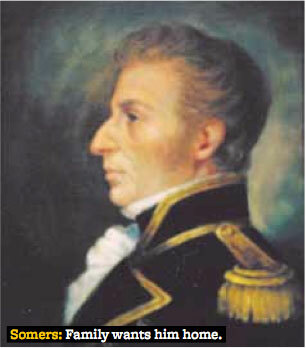 John Barry, Irish born Philadelphian - Father of the U.S. Navy.